Dec. 5 Alex Belser from the local NBC affiliate, KTEN attended the Second Annual Riley Round Up for MS conducting interviews and shooting footage. The spot aired during the evening news Saturday evening. There is an accompanying article which is available here. We thank Alex and KTEN for helping us get the word out about the event as well as helping us raise awareness for Multiple Sclerosis. 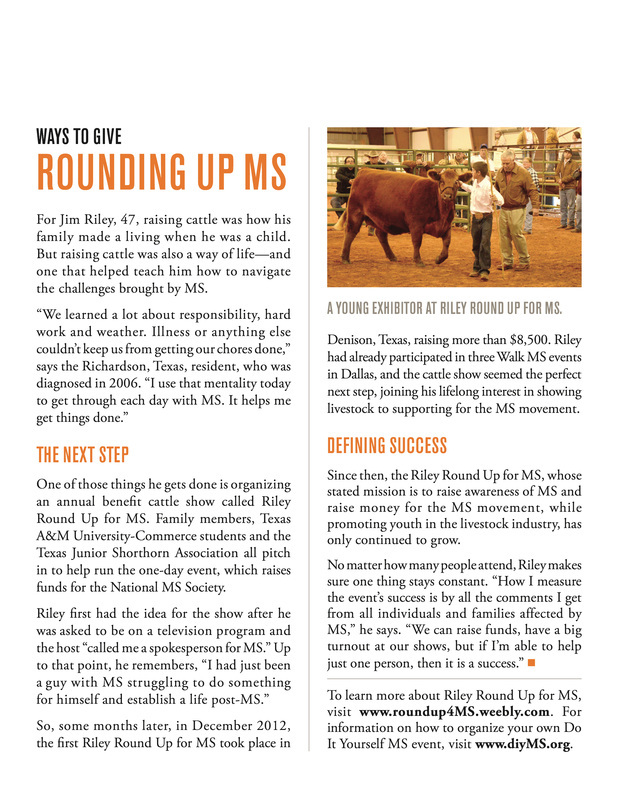 Riley Round Up for MS on airs on "Stockshow Confidential"
The Spring 2013 South Central MSConnection features an article on the 2012 Riley Round Up for MS. Click pdf below to read the article. 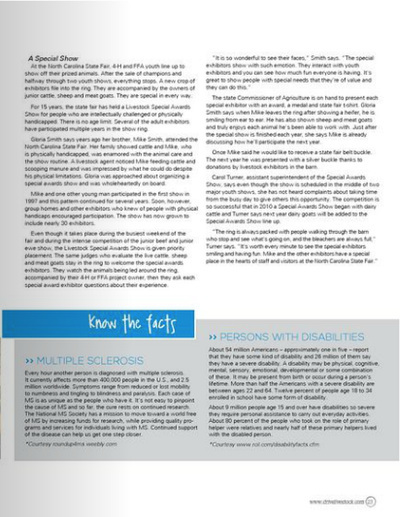 The article is on page 22 with more information on Multiple Sclerosis on page 23. 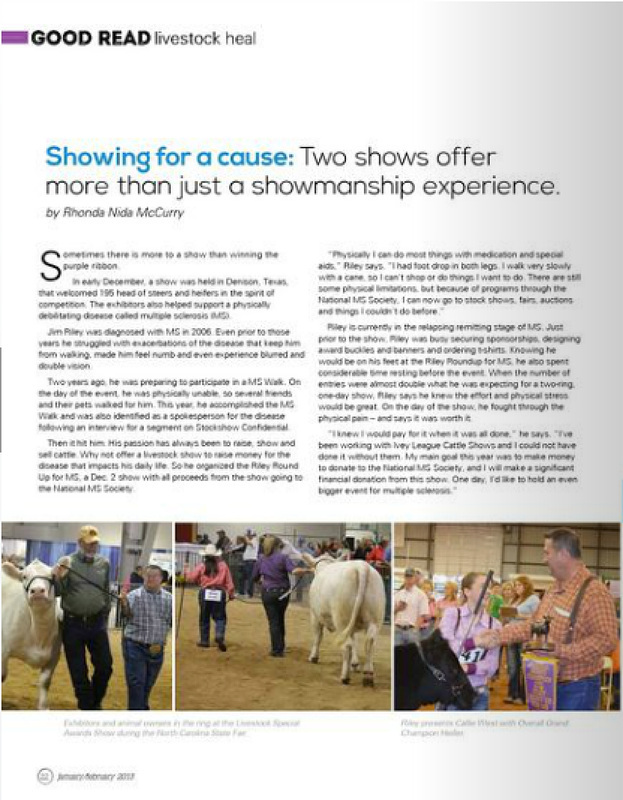 We thank "Drive" for their support with the 2012 show as well as including a story about us in their outstanding publication. 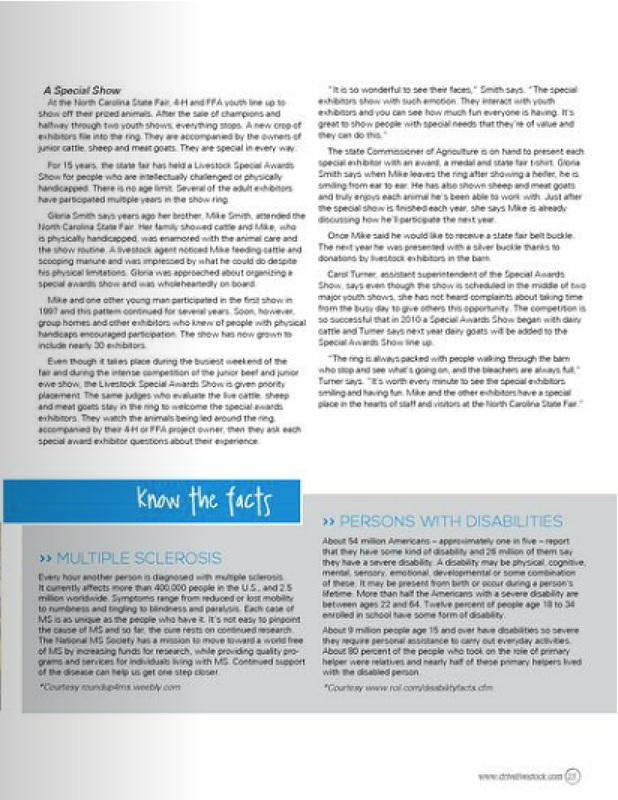 DENISON, TX--- Over 2.5 million people suffer from multiple sclerosis worldwide. The auto-immune disease targets the brain and spinal cord, affecting many of it's victim's mobility and sight. Currently there is no cure for MS, but one North Texas man is trying to do his part to fix that. 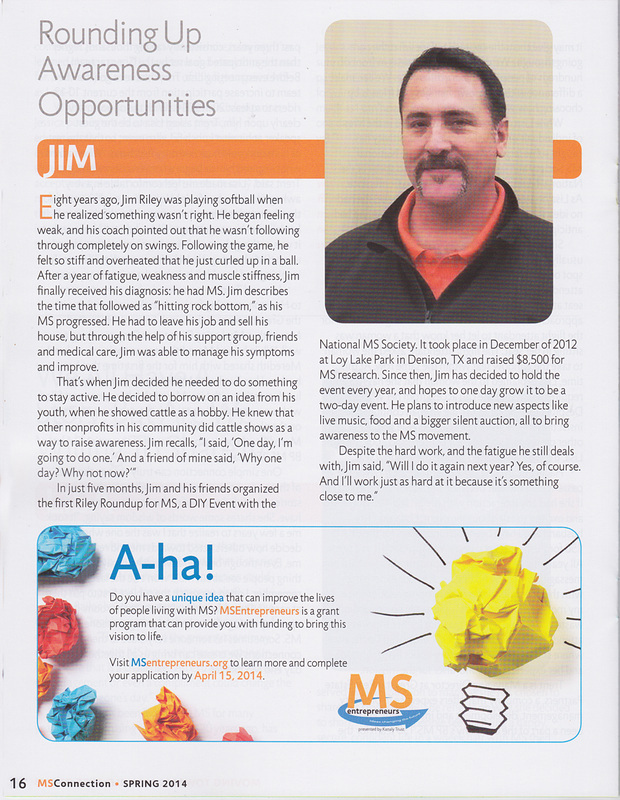 Jim Riley was diagnosed with MS over five years ago and is now dedicated to finding a cure. 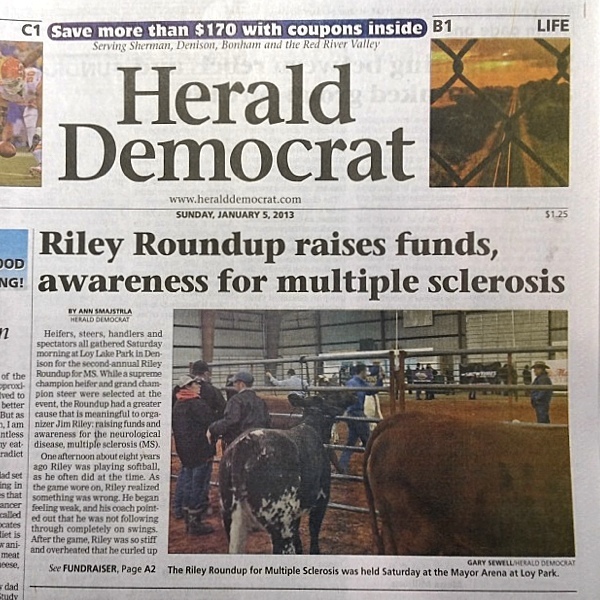 Sunday he hosted the 1st annual "Riley Round Up for MS" to raise money towards finding that cure. 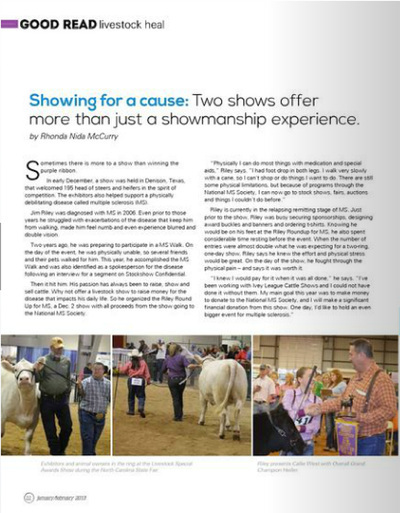 Sunday's event was a two-ring show that awarded belt buckles in both rings. During the event, there was a silent auction that included several gift items. All of the proceeds from the show will go towards the National Multiple Sclerosis Society, which is committed to finding a cure for MS.